• Books are made of vinyl labels with strong, industrial-grade adhesive backing. Labels conform even to bumpy surfaces. • Labels are immediately repositionable, but once they set stick on strong. • White labels are seen easily, even on thin wires. Labels are for indoor use only. 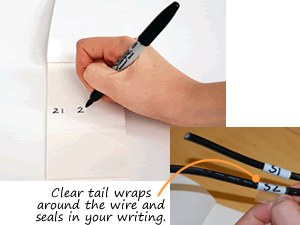 • Wire Marker Books are a convenient way to carry multiple labels at once. PocketPacks are perfect for taking on the job. • Labels are made on cotton cloth impregnated with vinyl. White stickers are easily seen on even thin wires. A white background makes it easier to keep track of different numbers. • Permanent, industrial-grade-adhesive bonds to the most difficult surfaces and shapes. Rubber based adhesive backing makes labels conformable to bumpy surfaces and repositionable. • Screen printed graphics. White acrylic fabric is coated with pressure sensitive rubber based adhesive backing. • Labels are for indoor use only and are guaranteed to last for years.